Bus from Ipoh to Kuala Besut is one of the favourite transportation option for "Perakian" to travel to Kuala Besut Jetty before taking ferry to the island paradise of Malaysia, Perhentian Island. Perhentian Island is hugely popular with snorkelers and divers. Most of the people come to this beautiful and rustic island to relax, enjoy the beach, and retreat. Perdana Express is the one and only bus company supplying bus from Ipoh to Kuala Besut. Perdana Express has only 2 daily departure from Ipoh to Kuala Besut at 10:30am morning and 10:00pm at night. Perdana Express is one of the popular bus operators which name is well-known among Malaysian. Perdana Express offers excellent and quality service to their customers to make sure their customers have a comfortable journey when travelling with them. 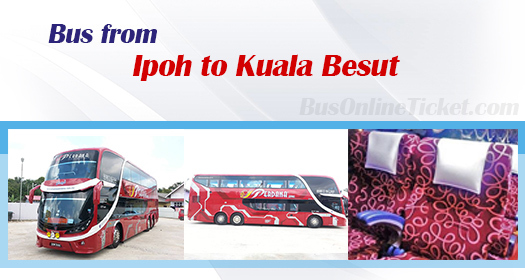 Duration required for bus from Ipoh to Kuala Besut is approximately 7 hours, depending on the traffic and weather condition on your departure date. Bus fare for bus from Ipoh to Kuala Besut is at RM 45.00. There is no difference between adult fare and child fare, both adult and child must pay the exact same fare for this bus service. All buses from Ipoh to Kuala Besut will pick up the passengers at Ipoh Aman Jaya Bus Terminal. The bus will drop off the passengers at Kuala Besut Bus Terminal, which is 5 minutes walking distance away from the jetty to Perhentian Island. Make your next vacation plan with us to Perhentian Island now! Book your ticket for bus from Ipoh to Kuala Besut with BusOnlineTicket.com before you heading to Perhentian Island. With limited bus schedules daily, passengers are encouraged to book bus ticket online in advance to avoid disappointment.